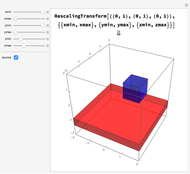 This Demonstration allows you to rescale 3D objects. The red cube represents the rescaled version of the blue cube. 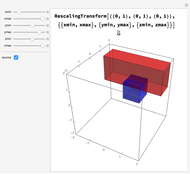 This Demonstration allows you to manipulate 3D rescalings of objects. 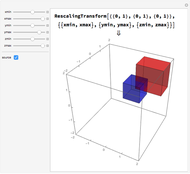 It is one in a series of twelve covering TranslationTransform, RotationTransform, ScalingTransform, ReflectionTransform, RescalingTransform, and ShearingTransform in 2D and 3D. Roger Germundsson "Understanding 3D Rescaling"